The UVCureMX UV spot gun is designed for small area curing and small part applications of UV or visible adhesives within the 365-500nm range. The unit will not overheat, even with continuous exposing cycles. This light gun maximizes the efficiency of applications involving ultraviolet light curing adhesives and materials. Designed for exposing small areas of UV adhesives in bonding applications such as fiber optic connections, electro-optics, lens assembly, PC board coatings, wire tacking and more. The time required for a typical bonding can be reduced from 15 minutes to a matter of a few seconds. Features a halogen lamp with a minimum output of 30 mW/cm2 in the 340-380nm range at a 1" distance. Bulb life is over 100,000 twenty-second curing cycles. The light is focused into an 84mm long curved tip fiber optic light guide, 11mm in diameter. Probe end should not come in contact with adhesive. Emits a safe, cool beam of UV light (250-400nm range). Environmentally protected housing, thermal overload protection, and filtered to block energy outside UV range. Includes power supply and gun-mounted holder. This reliable, compact curing unit is perfect for spot/larger area (10 cm x 10 cm) curing. The precision optics offer exceptional depth of cure. It generates a high intensity UV output of 100mW/cm2 and the UV peak is at 365nm. The unit has two automatic cycle timed settings: 20 seconds and 40 seconds. One squeeze of the trigger starts the cycle time. After the designated exposure time has been reached, an audible alarm sounds as the light shuts off. There is a trigger activated cycle interrupt that stops exposure when the full preset cycle is not required. The unit has a quiet, high CFM cooling fan, which starts when the lamp is activated and stops automatically 3 minutes after final exposure. 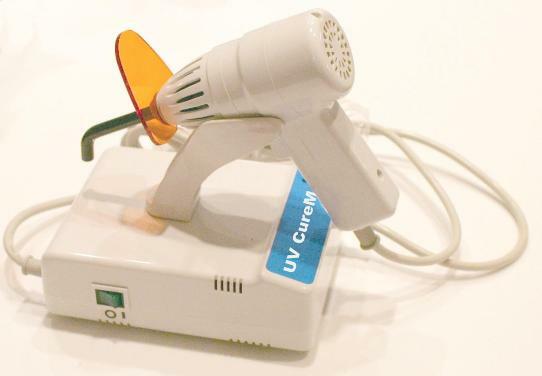 The UV Spot Gun Deluxe is equipped with a 8 mm x 60° light guide and an extended life (100+ hours) lamp. The UVCureMX carries the CE mark. We have replacement lamps and light guides. Note: Avoid direct skin contact and use suitable UV protective eyewear when operating curing gun.